When we plan a vacation, we go places that provide value to us in some form. Whether we chose our destinations from a historical standpoint, seeing family in a far-flung land or are escaping the weather – we want to go somewhere that will have many activities we can enjoy while we satisfy the reasons why we went on vacation in the first place. A Hawaiian vacation – for some – is a once-in-a-lifetime trip that can provide memories that will last forever. There are many beautiful beaches and coves to explore, and you have your choice of developed beauty or rustic beauty in the island chain, and if you chose rustic beauty, there is no better place than the Island of Kauai. Certainly, the Pacific Ocean is a playground all on its’ own, but you can only go to the beach so many times before you might want to discover what else the island has to offer. Kauai boasts many tourist attractions and outdoor activities for the active and not so active among us. They say when in Rome, do as the Romans do and this applies to a Kauai getaway and the traditional luau. Introduce yourself to Hawaiian cuisine and culture through a meal at Smith’s Tropical Paradise Luau. The dinner begins with a tram ride through the Smith’s Gardens that are full of exotic animal life and beautiful scenery. Sitting for a traditional Hawaiian dinner with some traditional dishes like Kalua pig, teriyaki beef, adobo chicken, sweet sour mahimahi, garden isle greens, and poi will whet your appetite. After dinner, a traditional performance from Rhythm of Aloha – with authentic performances from Hawaii, Tahiti, Samoa, Philippines, New Zealand, China and Japan in the open-air, torch-lit Pele Amphitheater. Another extremely popular activity is helicopter tours of the island by Jack Harter. The helicopter tour company has two types of flyover tours, one with the doors on the helicopter and one with the doors off. If seeing the island from the ground is more your speed, a horseback riding tour of the Princeville Ranch is a daylong trek that will take you around the 2500-acre ranch with a view of the ocean and vistas that will take your breath away. For the angler in the family, there is no need to despair as several fishing charter boats are operating in Kauai and the Pacific Ocean is home to many varieties of fighting fish for any angler’s enjoyment. If eco-adventure is what you crave, Kauai Island has trails that will lead you to some of the most impressive waterfalls in the Hawaiian Island chain. Kauai Island receives approximately 480 inches of rainfall a year, and all that water has to go somewhere, and that is down the side of Mount Waialeale. While most waterfalls are visible from the road or a short hike into the bush, the best way to see the impressive waterfalls of Kauai is to do from the air via a helicopter tour. Kauai Island sports many activities that will leave visitors more than satisfied as they will have memories that will last for life. 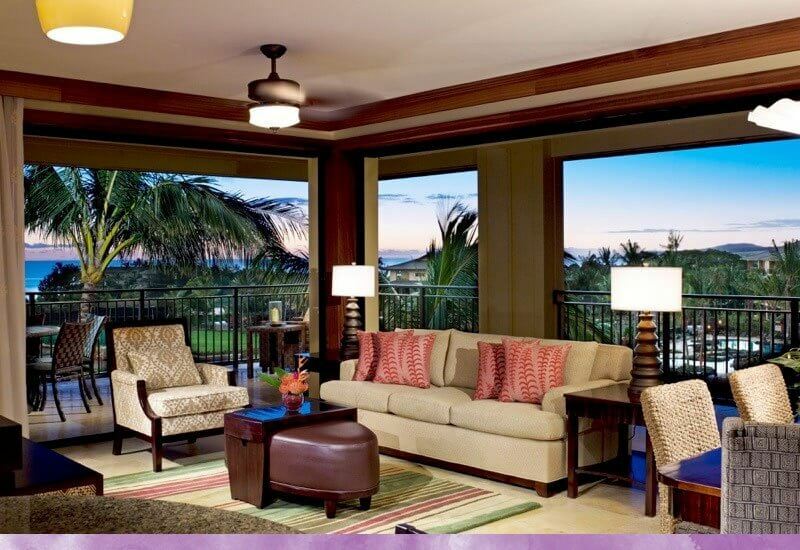 To book an unforgettable vacation, contact us at Koloa Landing® Resort today!